Try these old fashioned praline candy recipes and enjoy an authentic Southern confection. 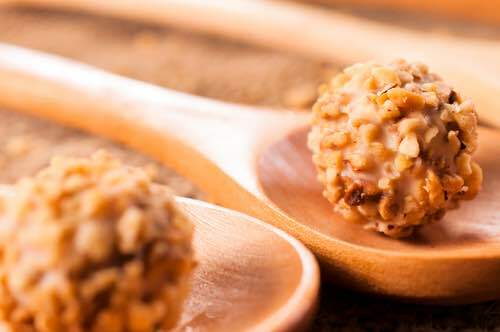 You'll find homemade pralines are super delicious when used in combination with other desserts. They make yummy crushed candy toppings for ice cream and puddings, and they're great in homemade ice cream. However, the best way to enjoy your pralines is to pop them into your mouth for a crunchy chewy treat. However, you'll find that it's impossible to eat just one piece. So, make lots! They're so good they won't last long! Unsalted butter is called for, but salted butter is fine for candy lovers who enjoy a salty toffee flavor. It's the dark-brown sugar and creamy butter that makes these marvelous Southern pralines taste so sweet and special. It's the sweet maple syrup and rich cream that make these the best pralines you have ever tasted. Form into balls and place in small paper candy cups for gift giving. They are absolutely scrumptious! 1-7/8 cups powdered sugar, 2 cups hickory nut or pecan meat cut in pieces, 1 cup maple syrup, 1/2 cup cream. Boil first three ingredients until, when tried in cold water, a soft ball may be formed. Remove from fire, and beat until of a creamy consistency; add nuts, and drop from tip of spoon in small piles on buttered paper. Mom sometimes made these "pralinettes" at night after the evening's chores were done. We all loved snacking on them. They are also delicious when made with peanuts or almonds if pecans are unavailable. 1/2 cup Evaporated Milk, 1 cup brown sugar packed, 1 cup granulated sugar, 2 cups pecans. In saucepan, combine milk and sugars. Stir in pecans. Place over low heat and stir until sugars are dissolved and mixture comes to a boil. Increase heat and cook, stirring constantly, to 236°F on candy thermometer or until a little mixture in cold water forms a soft ball. Remove from heat. Beat until mixture begins to thicken. Drop rapidly from teaspoon on aluminum foil. If mixture gets too firm, add a teaspoon of hot water. Makes about 2-1/2 dozen pralinettes. To begin this homemade praline candy recipe, line a baking sheet with aluminum foil. In large saucepan over medium heat, combine pecans, sugar, butter, brown sugar, milk, and vanilla. Heat to between 234 and 240°F (112 to 116°C), or until a small amount of syrup dropped into cold water forms a soft ball that flattens when removed from the water and placed on a flat surface. Drop candy mixture by spoonfuls onto prepared baking sheet. Let cool completely. Makes about 20 pieces. Generously grease a large slab or baking sheet. In a saucepan over medium heat, combine brown sugar, white sugar, and milk. Bring to a boil. Stir in butter, pecans, and vanilla. Heat, without stirring, to between 234 and 240°F (112 to 116°C), or until a small amount of syrup dropped into cold water forms a soft ball that flattens when removed from the water and placed on a flat surface. Remove from heat and let cool 5 minutes. Beat until thickened, then pour immediately onto prepared surface and let rest until firm and completely cool before cutting. Makes about 20 delicious servings. Legend has it that pralines were invented in the 17th century by Lassagne, chef to the Compte du Plessis-Praslin (1589-1675), minister to Louis XIII and Louis XIV of France. By accident or design, Lassagne combined caramel and almonds to create a delicious confection that became known as "praslin" after the Compte du Plessis-Praslin, and from which the eventual name praline is derived. It's believed that pralines were first carried to New Orleans, Louisiana by French settlers who substituted local pecans for the almonds to create the distinctive Southern confection that's loved today.